Light, attractive and stable, circular drying rails of hardened aluminium. No dangerous rods sticking out. A complete set for each size of tent includes drying rail and suspension straps. You can easily add a second rail. My birthday is every day, thanks to this ingenius product! I awaken in the mornings to a nice warm Tipi thanks to the Tipi Stove. My clothes hang from the drying rack and as I put them on the warmth radiating off the clothes and absorbing into my skin is mind blowing! It's like my birthday every morning!!! Not only for clothes allowed a great place to hang my solar lights. This was a great addition for hanging the camp towels up to dry and also gave the perfect place to hang my lighting on so we had light throughout the tipi and out of the way. Even better is the Drying Rail 9 Set can also accommodate the Drying Rail 7 and 5 for a total of 3 rails for hanging, the 5 is a bit out of reach if you're short though. 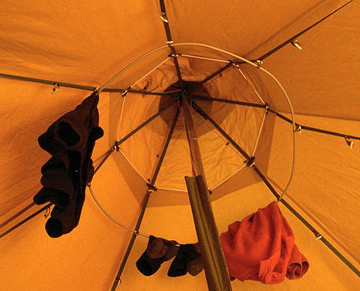 Click the button below to add the Tent Drying Rail Set - 9 to your wish list.